SUTHERLAND SPRINGS, United States — A total of 26 people were killed during a gunman’s shooting rampage at a Texas church during Sunday services, Governor Greg Abbott said, warning the toll may rise. "We are dealing with the largest mass shooting in our state’s history. There’s so many families who have lost family members. Fathers, mothers, sons and daughters," Abbott said. "The tragedy, of course, is worsened by the fact that it occurred in a church, a place of worship, where these people were innocently gunned down. We mourn their loss, but we support their family members." The gunman who opened fire, killing 26, was armed with an assault rifle and wore a ballistic vest, a law enforcement official said. "We believe he’s a young white male, maybe in his early 20s. He was dressed in all black, tactical-type gear and was wearing a ballistic vest," said Freeman Martin, regional director of the Texas Department of Public Safety. The shooter, who was found dead, was armed with a "Ruger AR assault-type rifle," he said. "Approximately 25 people" were dead, including the shooter, Wilson County Sheriff Joe Tackitt told NBC News. At least 10 people were wounded. The motive was not immediately known, he added. Exactly five weeks after the worst shooting in modern US history, the latest tragedy prompted an outpouring of condolences, led by US President Donald Trump. 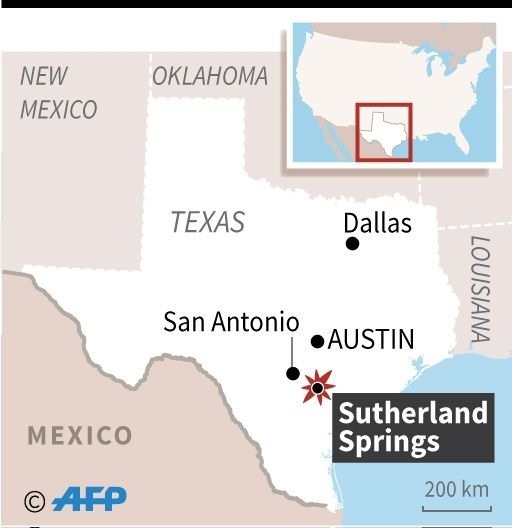 The worshippers were gunned down at First Baptist Church in Sutherland Springs, a small rural community about 30 miles (50km) southeast of San Antonio. With details rapidly unfolding, some unnamed officials were quoted as citing tolls as high as 27 dead and 20 or more wounded. The gunman reportedly walked into the church shortly before noon -- at a morning service that witnesses said was normally attended by some 50 people -- and opened fire. The dead included the 14-year-old daughter of pastor Frank Pomeroy, the church leader told ABC News. Annabelle Renee Pomeroy "was one very beautiful, special child," her father said. Frank Pomeroy had been in the neighbouring state of Oklahoma at the time of the shooting, and was driving back to Texas after the tragedy. Other victims included a six-year-old boy named Rylan who was in surgery after being shot four times, his uncle told CBS News. A two-year-old was also shot and wounded The Dallas Morning News reported. It was unclear how the shooter died. 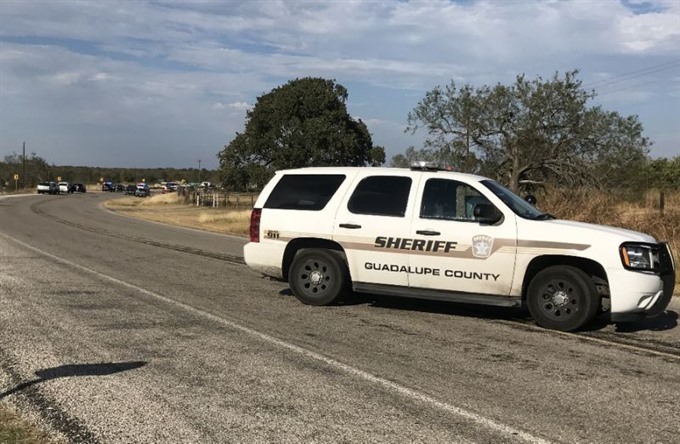 "There was no police chase," sheriff’s spokesman Sergeant Robert Murphy in neighboring Guadalupe County said, denying earlier media reports that the gunman was killed after a pursuit. "He was in his vehicle." Murphy did not give further details about the circumstances of his death. A spokeswoman for Connally Memorial Medical Center in nearby Floresville said the hospital received eight patients with gunshot wounds. Four were transferred to San Antonio. A witness working at a gas station across the street told CNN he heard at least 20 shots being fired in quick succession. Others nearby said the shooter appeared to have reloaded more than once. Emergency personnel rushed to the scene in the community of 400 people, and some victims were evacuated by helicopter. Police formed a perimeter around the area. Tearful relatives and neighbors stood outside, nervously awaiting news from inside the traditional, white-frame church. Agents from the FBI and the Bureau of Alcohol, Tobacco, Firearms and Explosives were heading to Sutherland Springs, the agencies said. President Donald Trump, who is traveling in Asia, tweeted: "May God be w/ the people of Sutherland Springs, Texas. The FBI & law enforcement are on the scene. I am monitoring the situation from Japan." Texas Governor Greg Abbott offered his condolences. "Our prayers are with all who were harmed by this evil act. Our thanks to law enforcement for their response," he said, promising more details "soon". US Senator Ted Cruz of Texas added: "Keeping all harmed in Sutherland Springs in our prayers and grateful for our brave first responders on the scene." The shooting comes just over a month after a gunman in Las Vegas fired down from a hotel room onto an outdoor concert, killing 58 people and wounding hundreds. It was the deadliest mass shooting in modern US history.